When I first began learning about raw feeding, I learned about warming and cooling foods and I was pretty excited because I was convinced that food energetics was the solution for Rodrigo's digestive issues, food intolerances, and environmental allergies. However, over the years, I've seen people jump on the warming and cooling topic with the same enthusiasm and I began to realize that while food energetics may be part of the solution, it's not the only solution. In fact, I personally think that it's a bad idea for someone to tackle food energetics as the first step on their raw feeding journey. If you clicked on this link to learn more about Warming and Cooling Foods, check out the video I did with Dr. Chris Bessent of Herbsmith, LLC. 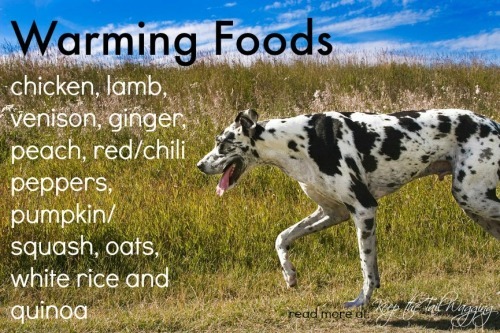 What are Warming & Cooling Foods for Dogs? Food energetics is a bit more complicated than what I'm sharing here and I prefer to keep things simple. The theory of warming and cooling foods comes from Chinese Medicine and when we apply food energetics to our dogs, we're told that there are ‘Hot' dogs and ‘Cold' dogs. Chinese medicine tells us that the food we feed our dogs is partially based on which category they fall into – hot or cold. Avoid warming foods and seek out cooling/neutral foods if you have a ‘hot' dog. Avoid cooling foods and seek out warming/neutral foods if you have a ‘cold' dog. * I've been told that turkey is warming food, a neutral food, and a cooling food; the reason it's identified as cooling here is because our holistic vet categorized it as cooling during our consultation. We're waiting to see if there is a change if we remove turkey from Rodrigo's diet. * I've seen salmon identified in different areas, so I'm not sure about this one. We don't feed our dogs salmon due to the risk of salmon poisoning, but we do give them canned salmon on occasion as a treat. If you are trying to heal your dog through food energetics, I suggest working with a veterinarian who practices Chinese Medicine. In my experience, incorporating food energetics has helped my dogs, however, I work with an experienced, local veterinarian who is experienced in food energetics and guides me on my way. You can find a vet through the AHVMA. I am looking at putting my GS on a diet with Cooling Foods. I am wondering if there is a good product available to purchase. If not, how much should I feed him each day? He is about 100 pounds. Thank you! I don’t sell food. 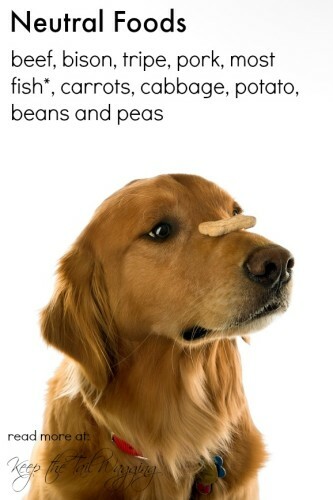 I’d recommend visiting your local pet store (not Petco or PetSmart) and working with a holistic vet with experience in Chinese medicine on your dog’s diet. My vet has been really crucial in getting our dogs’ diets right. This issue I have with kibble is that most of the vitamin premix is sourced from China. Vitamin premix is the mixture of vitamins & minerals which show up on the label of dog food. After kibble is cooked at such high temperatures and then processed further, it leaves the product void of nutrients. Premix is added. China’s premix product is problematic because it is contaminated with melamine. The FDA lead us to believe that salmonella is an issue. They discovered that it is the melamine that is making dogs ill and killing them. Raw food should not a problem for dogs with healthy immune systems. Approximately 30% of dogs already carry salmonella in their systems. It is natural for them. I have written EXTENSIVELY on this subject on my website essentiallydogs.com. Just use the little search bar and type in keywords like China, salmonella, FDA, and raw. Thank you so much, Janie! I had no idea about where the premix is sourced. Thank you. While Nature’s Logic may not use premade mixes from China, it’s still a kibble which isn’t species appropriate for dogs and ultimately leads to poor health, compromised digestive and immune systems, a chronic state of dehydration, joint issues (because kibble is an inflammatory), and more. I understand that dogs have been eating kibble for years, however, it’s not an ideal diet and something that I no longer recommend to anyone if they want to raise a happy, healthy dog. Please watch the movie Pet Fooled. This is so good. I only know human have hot and cold. I know I told you previously that I needed to research these things. Well…I still haven’t, so this post is super helpful to me. Thank you! The TCVM properties of food is one of my fascinations. It’s kind of interesting that not everybody agrees on the properties of some of the foods, though. I know. I’ve asked so many people about Turkey and everyone has a different answer. Yeah, turkey is definitely one on which experts don’t seem to be able to agree.